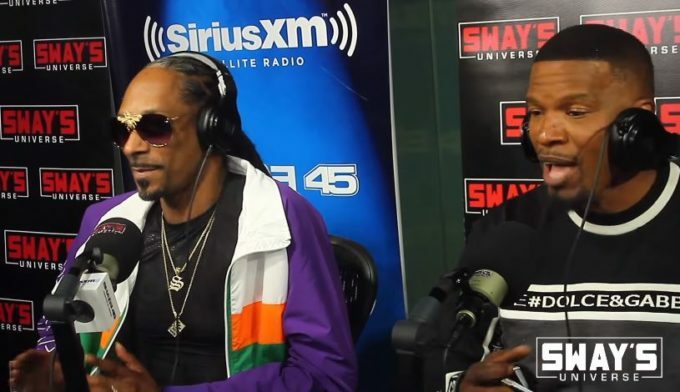 Snoop Dogg and Jamie Foxx are good friends and they had a chance to appear together on Sway In The Morning show recently. Towards the end of their chat, Sway asked the duo if they can come up with something on the spot for the fans. And so they did. The legendary rapper and the talented singer-actor made a whole new song right there live on Shade 45. Snoop rapped some slick verses while Jamie crooned on the smooth hook. Watch the gem below (starts at 22 minute mark).